NewBlue TotalFX 5.0.171209 for Adobe (RePack) » PooShock.Ru - Сборки, Репаки RePack, aep проекты, программы для редактирования видео и графики. NewBlue TotalFX 5.0 - содержит более 1400 пресетов в 129 плагинах. Это самая полная коллекция инструментов для титров, переходов и видеоэффектов от NewBlue. Bring gorgeous color correction and grading to every shot with ColorFast. Choose from over 20 presets for a place of inspiration or your final look. Control primary and secondary correction, high/mid/shadow, skin preservation masks and custom shape-matting. Use subtle adjustments to enhance your image. Dial in wild secondary colors while preserving true skin for an eye-popping effect. Smooth out jittery camera movement with Stabilizer. Choose from an assortment of presets to let Stabilizer analyze your footage. Focus on an images center to keep a flying object steady, or emphasize edges to allow your subject to move. This works great even without a consistent point to track. Remove all flashes from your scene or focus on the most distracting ones with Flash Remover Pro. Use an array of professionally created presets to reduce camera flashes. Then adjust sensitivity and thresholds to fix your most problematic frames. Create dynamic animations in only a few clicks with Titler Pro 3s animation presets. Its easy to combine simple animations for a more intricate result. Titler Pros drag and drop animations require no key frames, but gives them added control. The NewBlue Elements line adds a rich suite of compositing techniques to your NLE with over 250 presets in 21 plugins. 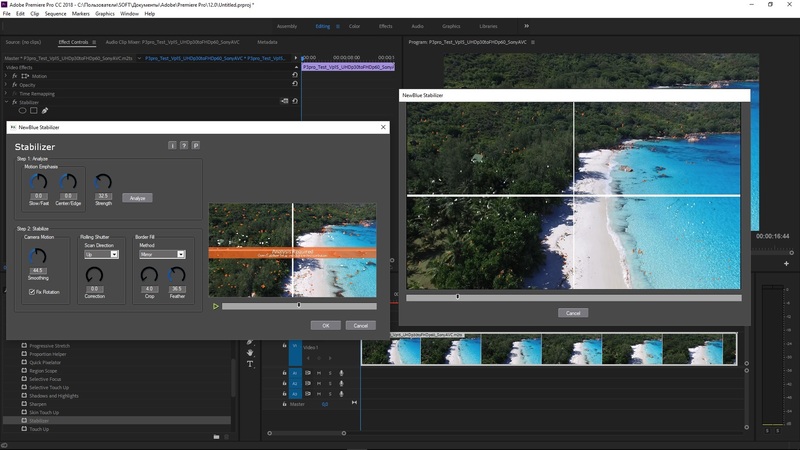 From the rapid keying power of Chroma Key Pro to the instant geometry of Split Screen, Image Mapper or Background Generator, once complicated or impossible compositing tasks become quick and easy in your workflow. The NewBlue Essentials line delivers over 275 presets in 24 plugins in a go-to toolkit for everyday post-production needs. The NewBlue Filters line instantly enhances video through an array of distinctive looks and color correcting tools with over 250 presets in 23 plugins. Find the exact color balance with ColorFasts streamlined correction and grading workflow, then shape the mood with a full suite of stylish aesthetics, from Film Color and Old TV to Tilt Shift and Dream Glow. The NewBlue Stylizers line delivers imaginative effects with 250 presets in 23 plugins. Discover rich painting styles with Cartoonr, Air Brush and Watercolor; use light oriented effects, such as Neon Lights to Glow Pro for stunning accents and atmosphere;andeExplore the boundaries with surrealistic filters like Metallic, Impressionist, and Paper Collage. The NewBlue Titling line features Titler Pro and a series of professionally-designed Lower Thirds and Styles collections. Streamline the creation of dynamic titles, lower thirds and end credits using workflow-enhancing tools, rich animations and 3D custom beveling. 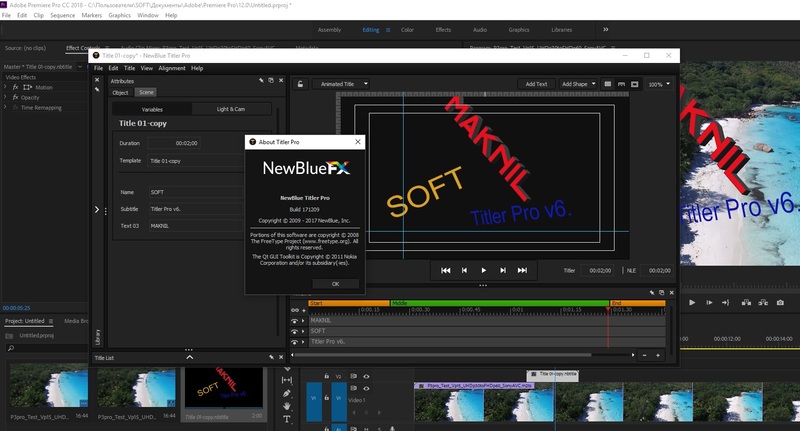 Plus, Titler Pro integrates all NewBlueFX plugins for a quick, useful way to develop stylized titles. The NewBlue Transitions line features over 400 presets in 37 plugins that provide a broad suite of cutting edge transitions that use light, color, and motion to deliver stunning, aesthetically fresh, scene-to-scene cuts. Move your audience from clip to clip with a variety of unique, stylized transitions for every mood or circumstance. Knock out backgrounds from green screen shots or replace skies with other textures using Chroma Key Pro. Youll find a variety of presets for the most common keys. Its effortless to create garbage matte, as well as change the color range, sensitivity, spill removal and more. Emulate a wandering cameraman, or simulate a wild car chase with Active Camera. Its never been easier to reproduce the motion of a hand-held camera. Just adjust horizontal and vertical shift values, as well as the rotation and rate. You can also choose from a variety of professionally designed presets. Produce a stylized backdrop from your own footage with Background Generator. Its simple to copy your clip then alter it with blur, color, saturation, exposure and animated panning. Use your clip behind a picture-in-picture for a complementary but different background of shape, line and color. Use the result inside text mattes, borders, or cutout masks for rich graphic work. Match the look of logos to your video without asking your client for new assets with Gradient Fill Pro. Its painless to alter, or completely change the color of images and text. You can adjust multi-point gradients, transparency, blending and drop shadow on any alpha image or video. Active Camera - Simulate camera movements to imitate a jittery hand-held cameraAlpha Processor - Manipulate alpha channel assets and create countless looks.Auto Pan - Zoom in and out on stills or video to highlight a moment or object.Background Generator - Create a soft, magnified backdrop of your original image.Chroma Key Pro - Easily remove solid colors and convert them to alphas or create outlines and shadows.Cut Away - Use various shapes and outlines to magnify a selected region.Drop Shadow - Create a shadow for overlays on any keying effects or animated matte.Flying Picture-in-Picture - Create a picture-in-picture that moves through the scenes without keyframing.Garbage Matte - Add a fast and convenient matte to your video.Gradient Fill Pro - Manipulate, boost, or completely alter the color of both your image and text.Image Mapper - Simulate screens and overlay video on top of objects.Luma Key - Manipulate lighting to blend an overlaying clip into a backdrop.Outline - Create multicolored glows around text, objects, or people.Picture Grid - Create a variety of different frames within your picture.Picture-in-Picture - Add 3D geometry, borders, shadows, and reflections to selective clips within your video.Picture-in-Shape - Layer one scene over another within a flexible four-point mask.Reflection - Create and control a mirrored reflection of your image.Split Screen - Display two shots at once with a variety of preset options.Tile - Replicate your video into a grid-like wall.Time Clock - Choose from a variety of presets to overlay a running timer on your screen.Viewfinder - Simulate the on-screen display of a video camera recording. Спасибо! Материалы, выложенные в выходные - просто праздник какой-то! Пушок, ты супер! Большое спасибо! Стабилизация не работает. Нажимаешь настройки - реакция 0.
почему версии для EDIUSа давно нету ? Наверное потому что многие команды которые занимались "таблетками" для этого пакета....ушли. Остался Team V.R.....но он занимается ADOBE. Что можно ожидать от патча размером в 70 метров, если полный пакет весит 1.2 Гб. В него входят плагины для AEX + OFX + RTFX + AVX......Team V.R просто разбил пакет на части. 1. Установил полный пакет. 1.2 Гб. Стабилизация и Titler Pro работает. Но на счёт Titler Pro всё довольно тяжело, с напрягом и я так думаю не надолго. Плагин постоянно лезет в сеть для проверки лицензии.....и так будет, пока качественно не вылечат PluginManager64.dll. Удачи и Огромное Спасибо Пушку за работу. Блин страшно ставить. У меня старая работает... Много в этом нового? Ой, Пушок, дорогой, спасибо за угощение! Вкусняшка!!! maknil, Привет. Что скажешь о стабилизаторе по сравнению с Mercally? ИМХО у меркали лучшая стабилизация. Решил попробовать Stabilizer. Нажатие на кнопку Setup ни к чему не приводит. Ни в СС 2017, ни в СС 2018. Пим, ну естестенно же Меркалли в разы лучше! Дишейкер без вариантов. К сожалению, могу подтвердить.....у меня тоже не открывается окно настроек и анализ Stabilizer. ilyha, если можно, тоже в сундучок заберу. Спасибо! maknil, В версии от Теаm VR также не работает Setup от Stabilizier. pim-pim Можно установить Полный пакет и сверху репак Пушка или патч от Теаm VR.....и всё будет работать. бизобразие((( для вегаса где?? какая такая бабайка вредничает? Спасибо. Вообще-то я не любитель так забивать систему тем, что не использую, но для сравнения можно попробовать поставить. Я с тобой согласен. Но NewBlue выпускает один пакет, без деления на AEX + OFX + RTFX + AVX. А репак или патч, просто меняет файлы. Так что, лишнего там врят ли что будет, большинство конечно будет не использоваться...... но главное чтобы работало. Мне в этом смысле легче....пользуюсь и ADOBE и OFX. Под лишним я имел ввиду кучу всяких фильтров, которые будут поставлены в систему вместе с интересующим меня стабилизатором. А для Corel vdeo studio такого наборчика нету?? ?